First performed in Naples in 1849, Luisa Miller marks Verdi’s transition from unpolished genius to mature master. This transition is fully realized in the opera’s third and final act. Here Verdi’s powers of dramatic intensity and expression are as moving and fully developed as anything he subsequently wrote. Salvatore Cammarano based his libretto for this opera, written for his hometown opera house (the San Carlo), very loosely on Frederich Schillers’s play Kabale und Liebe (Intrigue and Love). 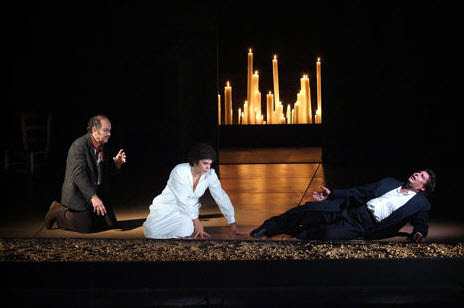 The dysfunctional relationship between father (Count Walter) and son (Rodolfo) on the one hand and the loving, but dependent, one between father (Miller) and daughter (Luisa) on the other, are themes that Verdi returned to time and again throughout his long career. While there are mother and child pairings in Verdi’s operas, ie Azucena in Il Trovatore is somebody’s mother and there’s Alice Ford in Falstaff, Nannetta’s mother, but she’s cancelled out by her husband. But fathers are far more common. Without looking anything up I can think of 10 Verdi operas where fathers are important. This production, as is apparent with a single glance, is not unique to Parma. Its was mounted in cooperation with Modena and Turin. This triple alliance accounts for the stylized sets and almost modern costumes. They work well enough and don’t detract from the music. There are a few goofy touches, such as having the Tyrolean villagers prance like they were atop a Swiss clock; these missteps were to convey happiness, which of course was transient. Luisa Miller requires three outstanding Verdi singers. Luisa – a solid lyric soprano (close to a spinto), her father Miller – a typical high baritone, and the hardest role to cast – Rodolfo. He’s a spinto tenor who must be able to float a lyric line at the end of the second act where Verdi’s tenor aria is one of the greatest and most expressive in the entire operatic literature. Fiorenza Cedolins sang the title role. She has a firm and expressive voice which goes shrill and sharp at his very top. She was very convincing as the simple maiden caught in a love affair complicated by dynastic plots. Rodolfo’s father the local count who achieved his position by murdering his predecessor want his son to marry a duchess. The ageless Leo Nucci (he was 65 at the time of this performance) was convincing and vocally secure as Luisa’s father. He starts the Adagio concertato at the end of the first act. This piece is one of Verdi’s finest concerted numbers and is especially remarkable for the extended acapella section in it’s middle. Here Luisa takes the melodic line with the harmonies filled in by the other principles. As mentioned above the tenor role requires a fully equipped spinto. Marcelo Álvarez at this stage in his career was a lyric tenor. He’s pushing his voice in the final section of the act where he forces his father to release Luisa by threatening to reveal how the Count obtained his position. Finale Act 1. He does better with the declamatory passages in the last act – see below. His singing of Quando le sere al placido is lovely and realizes the longing the celebrated aria so convincingly conveys. The beauty of this piece is ineffable. As mentioned above the last act is sublime. “Basically the act resolves itself into three pieces – an ensemble for Laura (a village girl with little else to do in the opera) and chorus, a duet between Luisa and Miller and one between Luisa and Rodolfo ending in a terzetto with Miller.” (Budden 1984). The whole act is seamless and written at a level of dramatic expression never before reached by Verdi. There is nothing like it in Italian opera up to this point. Here is the end of the final act starting with Piangi, piangi. Il tuo dolore. The emotional pallet moves from anger to remorse to resignation and finally vengeance. Note the explosion of 16 furious chords which punctuate Rodolfo’s realization of the enormity of what he’s done and what has been done to him. This is a device that Verdi uses with unequaled effectiveness when the emotional content becomes unbearable. Verdi had been in Paris during the premiere of Meyerbeer’s Le Prophète. He had learned a lot from both Meyerbeer and Donizetti. The result of this knowledge was something new and unique to himself. It was soon to take him to heights unreached by any other composer of opera. The rest of the cast, listed below, filled the subsidiary roles with distinction. This opera especially needs a conductor who understands Verdi. And fortunately the Parma house had a master at the helm in Donato Renzetti. His reading of the great overture is superb as his his support an guidance of the entire performance. A true Verdian. In summary, a fine performance of the first of Verdi’s mature masterpieces. Luisa Miller is in the standard repertoire, but it deserves to be performed more often than it is. Operabase.com lists it at 138 among all the operas in the world. Soloists, Orchestra and Chorus Teatro Reggio di Parma.